Shocka isn't the only one who recently brought an Infinity Gauntlet into the OAFE offices. I don't know when this piece was released; clearly it was in the past few years, but I didn't get it at a normal store; rather, I picked it up at discount retailer Marshall's. Looking on Amazon and eBay, it's old enough that people seem to think they can ask $60 for it, when the pricetag at Marshall's was only half of that. Rather than being based on the movie, this one is comic style, my preferred look. 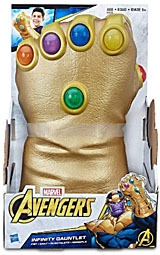 You'll recall that in the books, the Infinity Gauntlet was not some specific item, but was just Thanos' normal glove, the twin of the one he wore on his right hand. He just attached the Infinity Gems to it somehow. To that end, this version is molded with a texture suggesting leather, while the armored strips on the fingers are smooth and featureless. So are the blocky patterns on the trailing end of the glove, though those are probably meant to be a cloth seam, not metal. The colors on the gems are bright and vibrant, despite them being translucent. That translucency allows light to pass through, of course, which gives the stones depth that flat colors wouldn't. there's a bubbly texture on the inside surface of the gems, too. The glove is made from squishy foam, which makes sense since Hasbro is the home of Nerf. But can we just take a moment to reflect on what a big change ToyBiz made to the industry when they introdued their Hulk Hands? 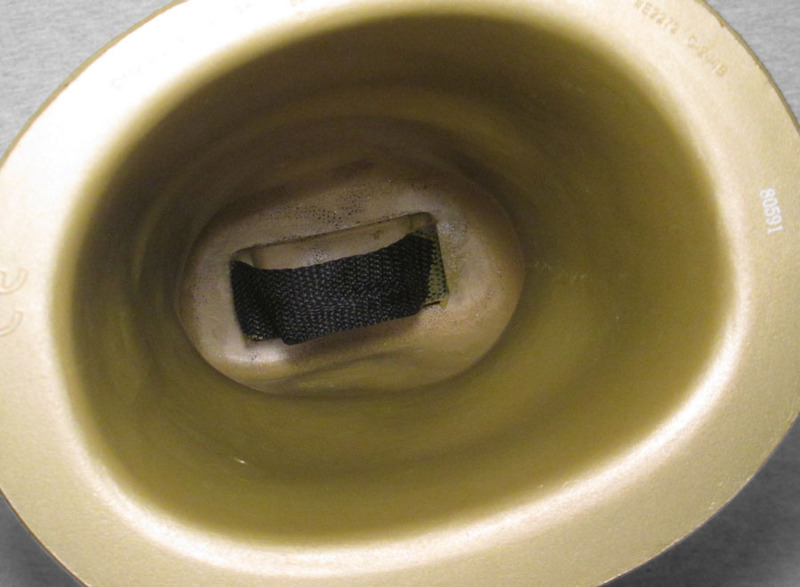 It was a new product category, but people are still copying it today. You can get foam raptor claws from Jurassic World, for instance. And clearly, a wearable Infinity Gauntlet. Although this is theoretically meant for kids, it's definitely scaled for an adult. 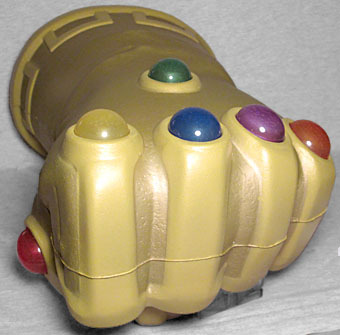 The glove itself is actual Thanos-sized, meaning its fist is twice as big as my own. I could probably fit two forearms into the opening, though the space inside for your hand is a little cramped. There's a nylon band in there for you to hold onto, but since, again, this was for kids, there really isn't enough room for a full adult hand to get around it - you'll be better off just using two fingers. 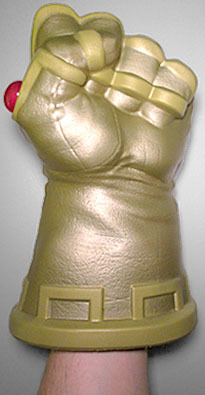 I didn't realize it at first, but this Infinity Gauntlet is the same one released in the SDCC 2014 Marvel Universe set - works out great for me, since I didn't really want any of the figures in that set, but always kind of regretted not getting the glove. The yellow color is less orange and more bluish, perhaps in an effort to make it look gold, but fundamentally it's still the same toy. The same squishy, punchable toy. Even the gems are soft and harmless! 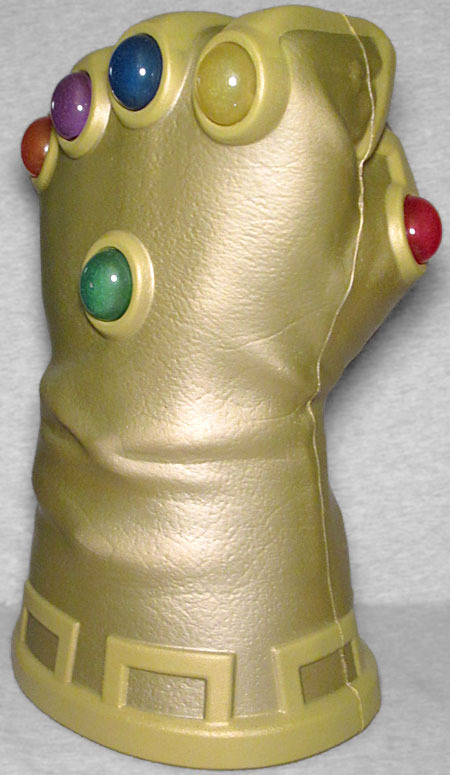 It's about 12" tall and, say, 7" wide, and is exactly what I was looking for in an Infinity Gauntlet replica. The only thing missing is the ability to snap your fingers. This entry was posted in addendums, blog exclusive review, Hasbro, Marvel and tagged Avengers. Bookmark the permalink.